Cloud Storage is the new way to save and share your files and the important aspect is that files are available all the time and from any location. 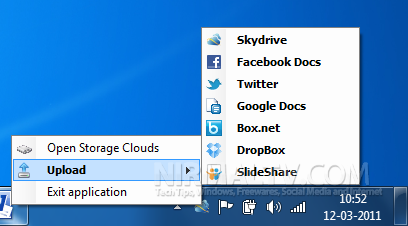 StorageClouds.me is a nice freeware tool which allows users to upload files to Skydrive, Facebook Docs, Twitter, Google Docs, DropBox, Box.net and Slideshare from your Windows system tray. You can even upload your Office 2010 documents directly using the StorageClouds.me add-in. The add-in is supported on all Office apps like Word 2010, Excel 2010. The standalone desktop application features all the cloud storage services and you can upload to any of the services from the interface. You can also use the Windows system tray to upload the files. For any uploading, you need to authorize the application to access the service. The Office add-in has a neat interface and you can upload your files directly from the interface without having to manually uplaod them. The tool supports Skydrive, Facebook Docs, Twitter, Google Docs, DropBox, Box.net and Slideshare cloud storage. The Office add-in is supported on Office 2000/2003/2007/2010.